Last week when I was at a workshop, my TOC and very good friend, Bev, had my kids playing with the parachute. Oddly enough, I have avoided this wonderful activity for years and years. I'm not really sure why. But when I got back to school I asked the kids about it and they said they LOVED it! So we went outside and they showed me the games Bev taught them. We all had so much fun, me included, that I did a little searching on-line to find even more games. 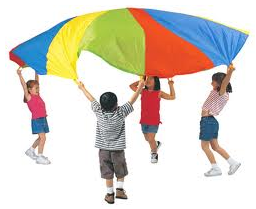 Parachute Ripples: Have children hold onto the edge of the parachute and billow it up and down on the ground. You may want to pretend that you are creating ocean waves, sand dunes, a pizza bubbling with cheese, bubbles or balloons to pop, etc. Parachute Popping: Have children seated around the edge of the parachute, with their legs underneath. Have everyone pull the parachute toward them so that it is taut. Throw lightweight balls (beach balls would be best), onto the parachute and watch them pop. Parachute Colors: Everyone chooses a colour to hold on to. Slowly billow the parachute up and down. Call a color when the parachute is lifted up and have the designated colors run under to cross to the other side before the parachute goes down. Parachute Mushroom: Have children billow the parachute up and down. On the count of three, have them step under, pull the parachute down in back of them, and sit on it to seal off the edges. You can sing songs once inside. With imagination, the balloon could also be a tent, house, a fort, the shade of a tree, or a cave. Parachute Cat and Mouse: Everyone sits on their knees and billows the parachute up and down. One child is chosen to be the cat; another child is chosen to be the mouse. The mouse tries to make it all the way under the parachute by crawling, without getting caught. Meanwhile, the cat is on top of the parachute, trying to find the mouse. The kids LOVED this game ... we played it with 2 cats and 2 mice! Parachute Pinwheel: Have everyone standing on the outside of the parachute and quickly pass it in one direction so that the colors spin. Repeat in the other direction. Parachute Keep Off: Have some children stationed around the edges of the parachute and others in the surrounding area. Place balls on the chute. The children holding onto the parachute need to work together to toss the balls off. The children in the surrounding area work together to throw the balls back on. Parachute Lean: Have everyone stand around the edges of the parachute and hold on. All at the same time, have children lean back while still holding on. Everyone should be leaning back, fully supported by the parachute and the team. Parachute Air Conditioning: With everyone standing up, simply lift the parachute up and down and enjoy the cool breeze that it gives everyone! This game is perfect for a hot day! 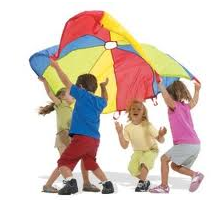 Parachute Friends: Partner your students up with another child and have them go to opposing sides of the parachute. Everyone can billow the parachute up and down. While it’s going up, yell out, “Friends ________ and ___________!” Upon hearing their name, the children run under the parachute, give each other a high five as they cross paths, and find their way to the outside again. Thanks for sharing about the parachute games. When I was a kid, I loved those days. I can't wait to signup for your giveaway. Thanks for hosting. The parachute was my FAV when I was a kid! Thanks for the reminder about parachutes. I haven't gotten ours out in a long, long time. Might make for a fun afternoon activity this week. PARACHUUUUUTE!! Who doesn't love to see that colorful fabric laying on the ground... ready to be played with? Thank you for this awesome resource. We are using a parachute for our field day on Friday and on my list to do this weekend was to look up games to play with the parachute. 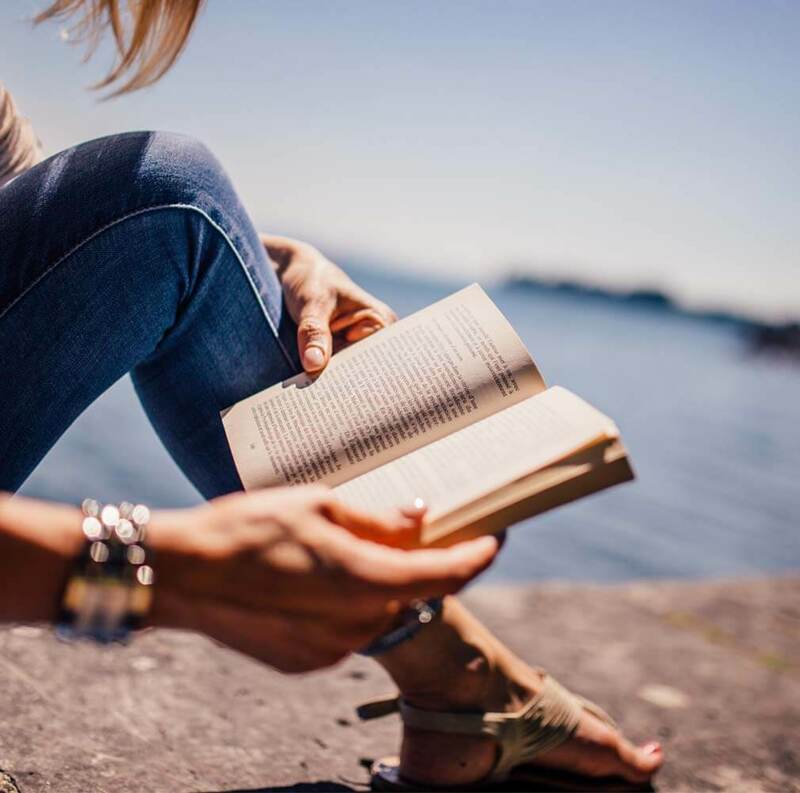 It was like you were reading my mind. You're welcome :) Totally happy I could help out! Love the parachute activities! Great for keeping those babies engaged at the end of the year! Thanks! That's a cool idea, Liz. Thanks!